Experts-Choice Low Viscosity Mold Material is a quick curing pourable mold making material. With a 1:1mixing ratio it is easy to use and is a good product for novices as well as those with mold making experience. Experts-Choice Low Viscosity Mold Material is very accurate and intended for use as a low production mold material. Low Viscosity Mold Material is very soft and works great on parts with undercuts. The cost for a one pound kit is $26.00. 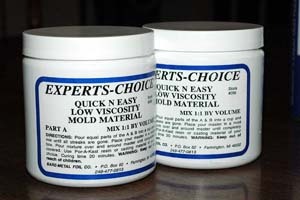 Experts-Choice Low Viscosity Mold Material sets in about 20 minutes. This product is self releasing and requires no special release agents. The following directions contain some basic instructions for using Experts-Choice Low Viscosity Mold Material. To use simply incorporate equal parts of the A & B into a container. Use a craft stick or spatula to blend the A & B together until all the white streaks are gone and the mold material becomes a uniform color. Then pour the mixed material into your mold box holding the container about 6 inches above the master and allow the material to fill the mold box. Care should be taken not to allow air to be trapped in the mold material. This can be avoided by pouring a stream of material from one place and not moving your hand around while pouring. Even though this material sets in 20 minutes, 24 hours at room temperature is required to fully cure this compound and achieve maximum mold life. If you wish to shorten the curing time follow the optional curing method. First place your master inside a mold box to contain mold material so that it won't leak out. Then pour the Experts-Choice LV mold material over your master model. Allow 20 minutes to pass and then remove your master carefully from the mold. It may be necessary to take a sharp knife and cut the mold down to your part so that it can be removed. Don't worry Experts-Choice Low Viscosity Mold Material has a memory and will close up again. Place the mold in a warm oven for 1 hour. This will cause the material to cure fully. After the mold has cooled to room temperature you are ready to pour in your resin.